Orange Blossom Energizer is a 2-phase skin care composition with valuable first-pressing botanical oils and blossom extracts. Shake well before use in order to mix the natural caring components, as this allows them to develop their full effect by combining the two phases. The skin regains firmness and vitality. 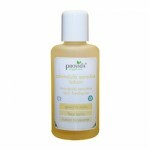 Application: Apply to cleansed skin in the morning and evening. Then, if required, apply a night- or day-care cream to suit your skin type. Shake well before use so that the two phases of the product combine.